Enjoy making these easy relish recipes for tomatoes and watermelon. So what is the difference between relishes and pickles. Do you know? What's the Difference between Pickles and Relishes? Relishes are different from pickles in that, as a rule, they are made up from more than one kind of fruit or vegetable and usually the pieces are cut or chopped and not put up whole. Often the foods in relishes are chopped or cut so fine as to make it almost impossible to tell what the fruit or vegetable was originally. The food value of both these products is not extremely high, unless a great quantity of sugar is used in the pickling. This is sometimes the case with pickled peaches or pears, but seldom if ever with pickled vegetables. 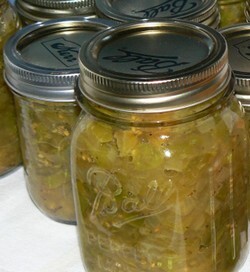 A pleasing relish may be made from green tomatoes after the frost has come in the fall and tomatoes on the vines will not mature. Select firm green tomatoes, wash them, and slice them. Peel the onions, and slice them into slices of the same thickness as the tomatoes, about 1/4 inch being perhaps the most desirable. Mix the tomatoes and onions, sprinkle them generously with salt, and allow them to stand for 24 hours. At the end of this time, pour off any excess liquid; then pour a small quantity of fresh water over them, and drain this off, also. To the vinegar and water, add the salt, sugar, and spices. Heat this mixture to the boiling point, pour it over the mixture of tomatoes and onions, and put into jars. Seal the jars while hot, allow them to cool, and then store. Ripe tomatoes form the basis of another relish known as ripe-tomato pickle. Like other relishes in which tomatoes are used, this relish is very satisfactory for meals in which pickles or relishes may be served. Blanch the tomatoes until the skins loosen, and then peel them. Remove the stem ends, and cut the tomatoes into quite large pieces. Chop the celery, peppers, and onions coarsely. Cook together until they are almost tender. Pour off the water. Mix all the vegetables together, and pack them into a sterilized stone jar. To the vinegar, add the salt, sugar and spices. Boil and pour this mixture over the vegetables in the stone jar, cover, and allow this to stand at least 2 weeks before using. An unusual, though highly satisfactory, relish recipe may be made from the rind of melons. The accompanying recipe is for pickled watermelon rind, but if desired musk melon rind may be substituted. In either case, only the white part of the rind should be used. Prepare the rind by cutting off the green skin and all the pink flesh on the inside. Cut this rind into strips 1 inch wide and 1 inch thick, and then into cubes, if desired. Cook in water until the rind may be easily pierced with a fork. Add the spices, water, and sugar to the vinegar, and boil until it becomes sirupy. Add to this sirup the cooked watermelon rind and bring to the boiling point. Then pack into sterilized jars, seal, cool, and store. 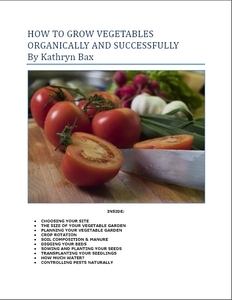 free e-Book "Growing Vegetables Organically and Successfully" ;When I sign up to receive the monthly homesteading newsletter. We do not spam you or give your e-mail address to others.